Let's talk about color. I can hear you, yes I can. But Deb, there's no black licorice in there. You are absolutely correct. There is no black licorice here. Sorry, but I loathe black licorice. When I was a wee one (Missed the dinos by a few years. ), whenever we had a cough, dad would give us Smith Bros cough medicine. It was black. It was the consistency of hot tar, meaning fluid but not like water. And it tasted of licorice, strong licorice, like they took every anise plant they could find in a 12 county radius of the plant and soaked it to wring out every molecule of flavor. Dad loved this stuff, swore by it. My mother, reading this post, is going to be laughing right now. She knows. She knows. I remember trying to keep a cough quiet from dad and only letting it out into my pillow or my elbow. I'd go into the bathroom and turn the water on full stream in the hopes it would make enough noise to drown out the sound of my cough. I did all of this and more because I did not want to be given the black goo. Dad said if it didn't taste bad, it didn't work, and he was dead serious with that comment. The thing is, the stuff worked. It stopped a cough like Jersey barriers stop a cyclist. Bam. Done. Over. Yet choking down that syrup, which, incidentally, burned as you swallowed it, took everything you could muster. I can remember dad taking some for a cough and then licking the spoon. I love my father but sometimes, he was nuts. When Smith Bros introduced a cherry flavor, we rejoiced. It was good and, I thought, did the same thing as the black stuff. We could take a teaspoon of the cherry flavor and sleep all night with no coughing. It wasn't as viscous as the black stuff, but it sure did taste better. It was in the house for all of one bottle's worth and dad refused to buy it again because he felt it wasn't "real" cough syrup. 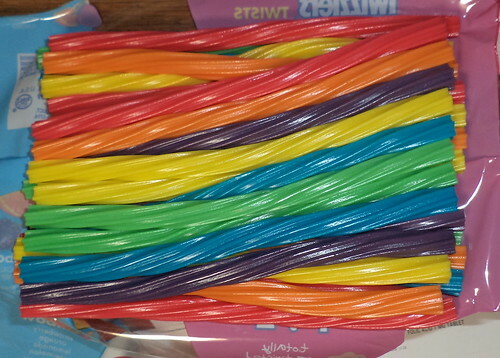 So, while I know the term "licorice" generally refers to the black version, I can't stand it. Thankfully Twizzlers understands there are a lot of us who don't care for the anise flavor. The flavors of Twizzlers are more than a handful and, at the grocery to get cereal, dish soap and apples, I found this bag. Be still my heart. Cherry, orange, lemon, lime, grape and blue raspberry; on sale, too. I should have purchased a second bag. Be proud of me. I made this bag last for 3 servings.